“Perdido Key is different from most other Panhandle beaches because beach property owners also own the sandy beach to the water’s edge. For many years, residents of the key have resisted efforts to shore up eroded swaths of beach by pumping in sand from the deep Gulf. Under Florida law, when a beach is renourished [sic] through a sand-pumping operation, the state then controls the expanded beachfront. Underhill assured beach property owners that the changes to the habitat ordinance, approved by Escambia County Commissioners Thursday night, would not imperial [sic] their private property rights. Perdido Key certainly is different. There are many condominiums along the beach, generally more expensive than typical homes in the rest of the District and County. This is in part because some of it is truly beach-front property. What some proposed is more properly called beach restoration. Beaches are eroded by the interruption of the natural flow of sand along the beach by efforts to deepen various navigation inlets and by jetties that prevent sand from filling the inlet channels. Along the beach behind the dwellings along Perdido Key Drive, erosion has occurred without sand replacing it, as it would have naturally done without the navigation inlets and jetties. The erosion has removed some of the beach that the property owners consider their property. It was there at one time but now it is not. It seems fair to ask how a property owner can assert ownership of something that no longer exists. If they believe the sand removal is caused by natural processes of the Gulf of Mexico they could sue. The Gulf of Mexico is immune from lawsuit, so they may want to sue the State and Federal governments for improving navigation inlets. Those entities have sovereign immunity, though, and such a lawsuit would be likely to be expensive with not much chance of success. Beach restoration could be accomplished by pumping sand onto the beach but according to Florida law “the resulting additions are subject to a public easement for traditional uses of the sandy beach consistent with uses that would have been allowed prior to the need for the restoration project.” I believe that translates as – the sand added to the beach could be used by the public, so the restored beach could not be private. Mr. Underhill’s characterization of beach restoration as a land grab by state officials is wrong. The property would continue to be owned by the current owners after the beach was restored. They would just no longer be able to exclude the public from the restored portion of the beach. This is really no change at all because they cannot exclude people from a non-existent beach. What these condominium owners want a restored, but still private beach; could be accomplished with an assessment by their condominium associations to pay for dredging and pumping sand onto their properties. The beach would be restored and they clearly would own the sand on the restored beach. Then they could be as private as they wish. That is not what they really want. The want a subsidy from the rest of us to pay for restoring their private beaches. They get the benefit of the dredging and pumping and we, federal and state taxpayers, get – the bill. The property owners on Perdido Key are not so different from the rest of us. All they want is an unfair advantage so they can continue to be able to say “I’ve got mine, forget you.” They can’t afford the unfair advantage they want. Naturally they want someone else to pay for it. What Mr. Underhill calls a “land grab” is not that at all. It is merely a simple of balancing the equities. 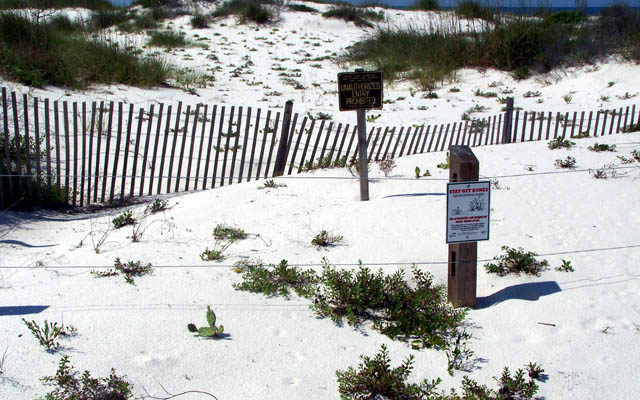 Let the Perdido Key owners pay for beach restoration or give up on private use. If we all pay for it we all should be able to use it.